A lavishly scented semi-solid butter than can be used for moisturizing as well as a subtle perfume, similar to the solids I made previously. 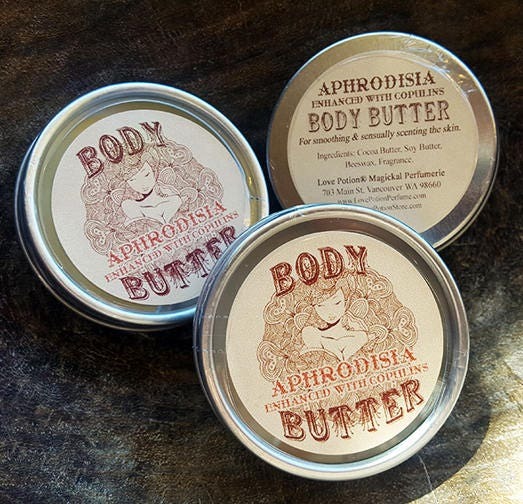 Show your skin you care with our smooth blend of cocoa butter and soy butter, it leaves you touchably soft and our choice of magically alluring scents means you will smell irresistible! 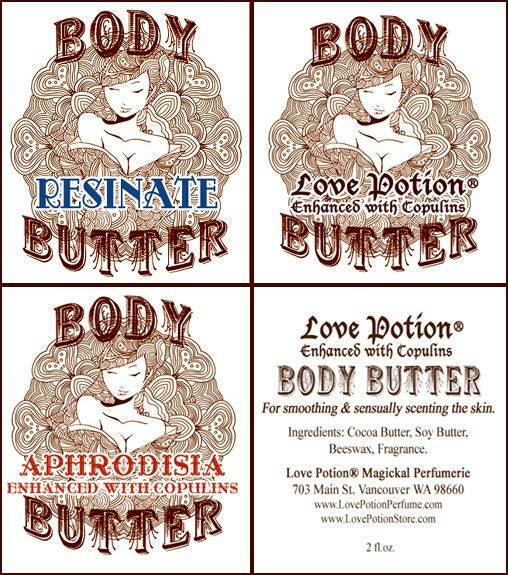 Every ingredient is for love, lust and bliss! Bright honey and tangerine, romantic rose, spicy ginger, smooth sandalwood and vanilla and a smooch of almond, plus a dose of copulins! Irresistibly delicious full-bodied vanilla, with subtle notes of amber, rose, verbena, greenery, apricot, patchouli and more. The natural cocoa butter blends with our signature Love Potion: Original fragrance to create a luscious variant of its’ own. Add the allure of copulins and who could possibly resist your olfactory magic?! Featuring a treasure chest of exotic resins, this unisex blend starts with an earthy blend of amber and patchouli, adds powdery touches of frankincense and myrrh, and finishes with a few precious drops of exotic dragon’s blood and oud. Ingredients: Cocoa Butter, Soy Butter, Beeswax, Fragrance. Packaged in a metal 2 oz tin with window top. Note: We cannot ship these during the heat wave!